The full text is as follows:! 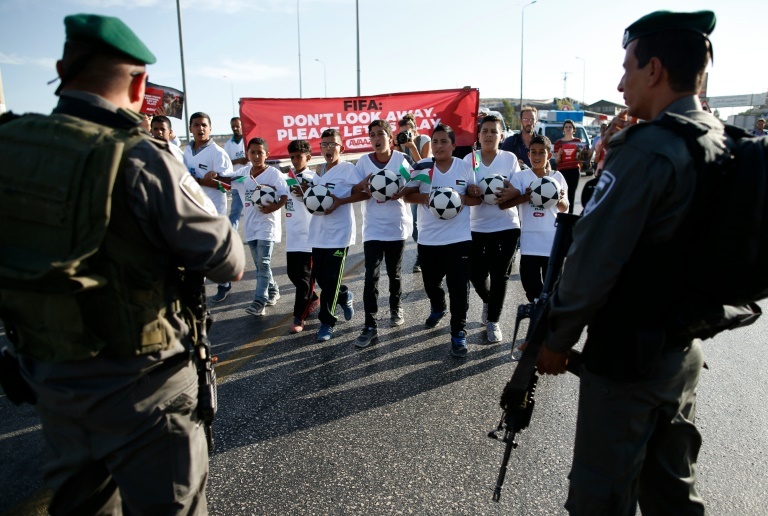 “Palestinian children marched on an Israeli settlement to play football there on Tuesday, in a protest ahead of a key FIFA meeting to discuss teams from Israeli settlements. Boys aged between 11 and 15 from nearby Bedouin communities tried to enter the Maale Adumim settlement in the occupied West Bank. They chanted “Infantino let us play,” in reference to the president of football’s governing body, Gianni Infantino. Soldiers, border police and other security forces stopped them shortly before the entrance to the settlement of around 40,000 people. Six Israeli teams are based in settlements in the West Bank, which are considered illegal under international law. Palestinian officials have called on FIFA to expel the clubs or force them to move inside Israel’s recognised borders. FIFA’s executive committee is expected to discuss the issue during meetings on Thursday and Friday. Infantino told AFP last week the settlement clubs were a “priority” for him. The children at the protest came from communities that face demolitions and forced displacement as a result of settlement building, according to rights groups. Fadi Quran of the campaign group Avaaz accompanied the children and repeatedly asked soldiers to allow them through. A member of the Israeli security forces replied: “They can play anywhere they want, but not in Maale Adumim”. Dima Yousef, a 21-year-old who plays for the Palestinian women’s team, called on FIFA to act on the issue of settlement clubs. She said movement restrictions make it hard for Palestinian players find to reach training sessions and matches. The Israel Football Association accused the Palestinians of dragging sport “from the football field into a political one”.